Robots Penetrate the Advertising and Public Relations Industries by Facilitating More Stress-Free Intelligent Communications, Thanks to a New Communication Psychology from International Robotics, Inc.
Robots have come one step closer to effectively communicating with humans in all facets of business and consumer environments. New approach introduced by International Robotics, Inc. combines impressive design/engineering, with knowledge of human psychology and communications to simulate truly intelligent interactive robots, able to communicate in any type of environment. This is particularly true in the highly competitive business, consumer and political environments of our modern day world. After 35 years of researching the interrelationship between human beings and machines, International Robotics, Inc. (IRI) is pleased to announce the most advanced communication robot in the world, the Millennia. Pioneers in the field of Technology-to-People Behavioral Psychology, IRI has created an adult-size multilingual interactive robot that is able to communicate with any age, social, ethnic or cultural group in any type of environment. “Most interactive robots have the ability to convey commercial messages, but IRI’s robots have the ability to command the attention and respect of today’s more complex – and often more jaded – audiences by openly communicating, as a human would, with any member of society regardless of age, social, ethnic or cultural background,” said Robert Doornick of IRI. The Millennia is able to overcome the fears and anxieties that limit many human communicators. 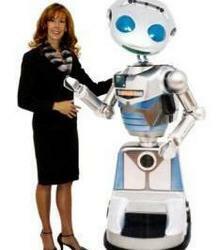 This allows the robot to act as an effective PR, marketing, advertising, promotional, educational or entertainment tool. In addition to a very sophisticated remote control system used for live interaction, the robot is programmable for automated presentations, with new presentations able to be transmitted wirelessly via the robot’s on-board Wi-Fi connectivity. Just trigger the corresponding command, and the Millennia will gladly oblige, supporting a Keynote Address, Press Conference or exhibit, complete with speech, motions, music and audio effects. IRI employs and trains human operators, who remotely bring these communication robots to life, and who are carefully selected for their communications skills and persona. These robot operators are refined, cultured, multilingual, compassionate, witty, humble and tireless individuals who absolutely shine through their performances. For more information on IRI’s many Communication Robots and Technologies, please visit http://www.internationalrobotics.com .